Gallium nitride (GaN) is a widely used material in optoelectronic devices such as Light Emitting Diodes (LEDs). LED structures are mostly grown by epitaxy on sapphire substrates but, for cost reasons, silicon emerges as a possible contender. Nevertheless, the large misfit and the difference in coefficient of thermal expansion between silicon and the nitrides lead to numerous dislocations and possible cracks. They usually appear during the cooling stage in the growth process. 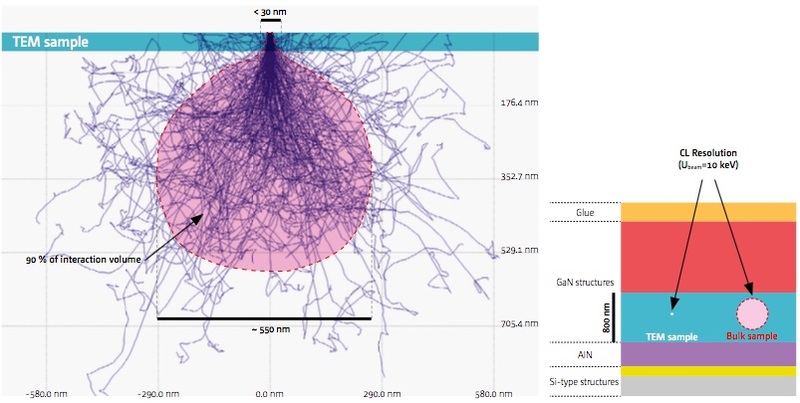 Since both cracks and dislocations are detrimental for LED applications, it is crucial to determine local defect concentration and other features like doping and strain. 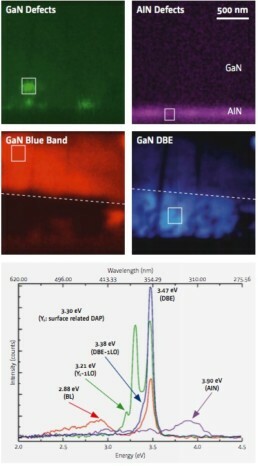 The cathodoluminescence (CL) technique constitutes a fast and highly relevant way to investi-gate GaN properties. The distribution of non-radiative defects such as dislocations can be directlyvisualized. The energy of below band gap emission lines allows us to identify point defects. Cathodoluminescence hyperspectral maps give relevant information on the spatial variation of strain, doping, growth direction and carrier concentration. 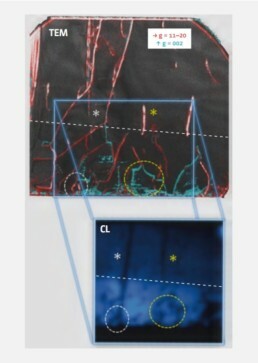 In practice, the spatial resolution in CL can be strongly improved by constraining the size of the interaction volume between the electron beam and the sample. The use of thin objects such as TEM samples happens to overcome this physical limitation. It significantly decreases the lateral size of the interaction volume from 550 nm (at a beam energy of 10 keV into GaN) to less than 30 nm.A specific cryogenic sample holder compatible with TEM samples has been designed to perform measurements on the Attolight cathodoluminescence microscope at low temperature (down to liquid He). Nevertheless, the small probed volume in the sample may significantly reduce the collected signal and thus limit the measure ment resolution. The optimized light collection of the Attolight CL system perfectly overcomes this difficulty. It allows to carry out highly resolved hyperspectral mapping (with a very high signal-to-noise ratio) within short durations on cross-sectional TEM samples. Such measurements are not limited to GaN and can be extended to many other light emitting materials.